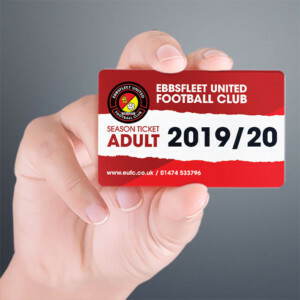 The headlines will be about how Ebbsfleet United put a dent in Leyton Orient’s title charge but, for home fans, the talk is of their own team’s fortunes with today’s deserved win over the league leaders seeing the Fleet climb a place to sit just two points outside the play-offs. It was, as usual, a superb team effort but the Fleet’s defenders might have the bragging rights in the dressing room this evening as not only did they keep a clean sheet and Nathan Ashmore was named sponsors’ man of the match, but two of them weighed in with the stunning goals that proved the difference. Garry Hill made one change, recalling Danny Kedwell who also took over the captain’s armband from Andy Drury, while Cody McDonald was on the bench. Orient were without skipper Jobi McAnuff but handed one of their two new signings a start, Jordan Maguire-Drew. George Elokobi and Dan Happe were brought in together with both first-choice centre backs out injured. Neither side raced out of the blocks, but it was the Fleet who began to look the hungrier, forcing some early corners. The second of those on six minutes was a well-worked move, Chris Bush’s persistence finding Bagasan Graham who cut into the box and saw his shot turned round the post by Dean Brill. Graham was very bright in the early stages, getting away down the left and attempting to deliver the ball across goal at every opportunity. The home side looked set to open the scoring on 10 minutes when Ebou Adams slid a ball through for Michael Cheek to run on to. He eased past Ling but lost his footing as he looked to go past the goalkeeper and Orient survived. 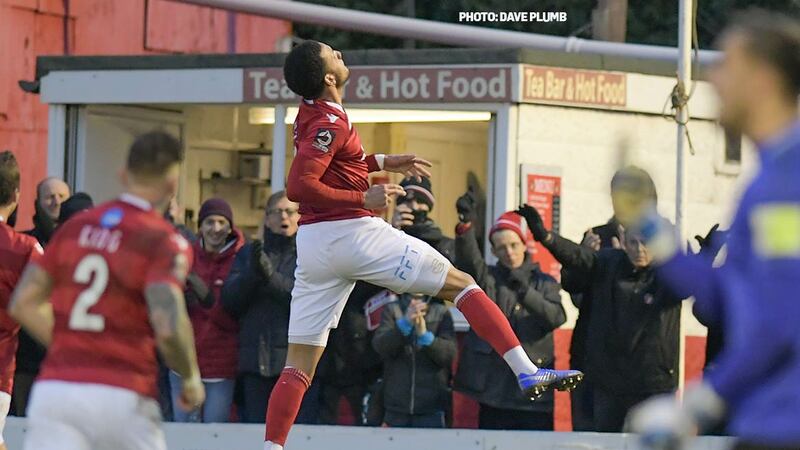 The visitors got their first sight of goal three minutes later as Sam Magri’s back pass saw a headlong race between Macauley Bonne and Ashmore for the ball, the Fleet keeper having to pick it up as he couldn’t risk kicking it clear. The referee awarded an indirect free-kick only a few yards out but Bonne’s goalbound shot was blocked by Ashmore rushing off his line. Fleet continued to impress and a third corner saw Bush’s header cleared off the line but the referee blew for a foul in the aftermath. 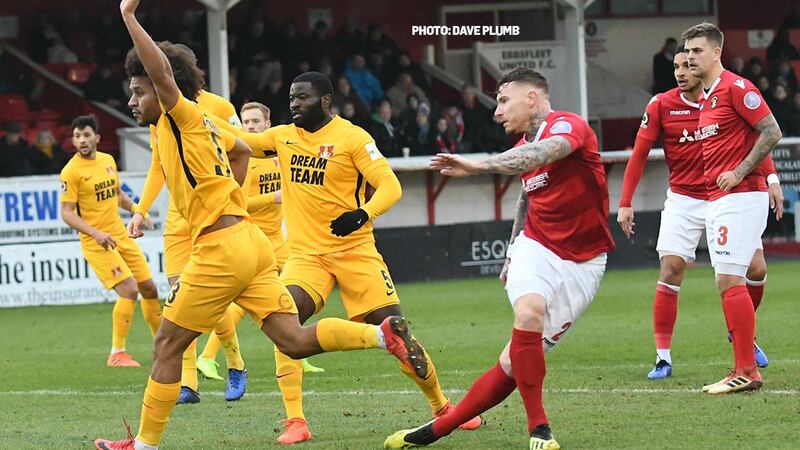 Hill and Ian Hendon had plenty to say to the fourth official as Adams was forced off with a bloodied mouth after clashing heads with Elokobi and Fleet were down to 10 men for a lengthy period. But they weathered that and then went ahead in the 23rd minute. A Jack Payne corner from the right was kept in motion by Bush and as it bounced in range of Jack King, he turned and arrowed a fantastic shot into the top corner for his first goal for the club. Not content with that input, King then performed two crucial interceptions at the other end as the determined league leaders came looking for an equaliser. And they really should have got it on 32 minutes when Charlie Lee’s disguised pass and Maguire-Drew’s well-timed run saw the latter through on goal. He did everything right, waiting for Ashmore to commit, but then pulled a shot wide of the far post. Orient then forced a couple of corners and some exuberant approach play saw James Brophy reach the byline and cross for Bonne to get an attempt on target. Somehow Ashmore seemed to change direction and get a hand on it to push it clear of the crossbar. The visitors closed out the half on top in terms of possession, pushing Koroma further to the left flank seeming to work well, but the Fleet kept them at bay, though were grateful for an offside flag against Bonne just before the whistle as he got behind the home defence. Orient began the second half where they left off and earned a couple of corners in quick succession, Wilson doing well to shepherd out a cross that dropped invitingly at the far post for Joe Widdowson. Graham got away on the break to relieve some pressure but was denied by Alex Lawless as last man back for the O’s. Then on 54 minutes he showed some quality on the left to get a cross into the middle where Payne appeared from nowhere to send a first-time shot on target that Widdowson and Brill instinctively managed to block between them. At the other end, Ashmore was showing why he’s such a popular figure at the club with a couple of top saves. 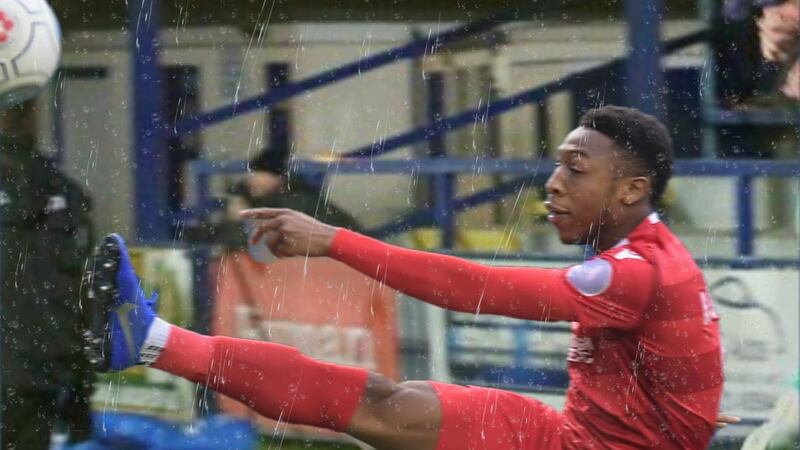 He pushed over Koroma’s shot as play went end to end for a spell then got down against the odds to grab Widdowson’s header to Happe on the line. It was clear Fleet needed another goal and they got it on 63 minutes. Having disappointed with a free-kick a few minutes earlier, Bush had sight of goal with another. Payne feinted a run and Bush stepped up to drive one of the best free-kicks in recent times towards the Plough End goal and in it flew. Orient threw on three subs in a desperate bid to get something from the game while the Fleet simply needed the mental strength to see it through, having been two up with a similar time remaining at Chesterfield two weeks previously. And while Orient pushed for a breakthrough, the home defence was superb. They were helped by some poor finishing, not least when Bonne skied a cross from the left by Brophy over the bar and into the despairing and sizeable Orient contingent behind the goal. Fleet could have been 3-0 up when Cheek dropped his shoulder to dummy a defender then found Kedwell with a ball into the box but the skipper shot over from a good position. 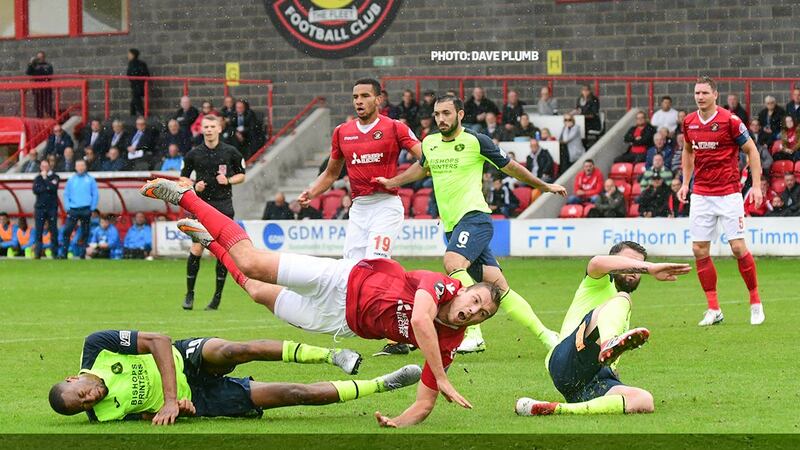 There might have been a nervy finish 13 minutes from time when substitute Turley headed against the post and the O’s kept pressing but without breaching the back line. 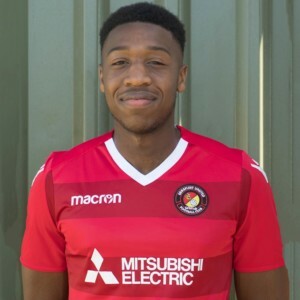 Substitute Corey Whitely was straight into the thick of things with a firm drive at Brill and Koroma had one last effort at the Swanscombe End with a free-kick that was one of Ashmore’s more routine saves of an excellent afternoon but Fleet sailed home to collect the three points. 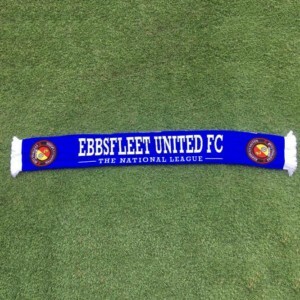 EUFC: Ashmore, Wilson, Bush, Magri, King, Adams, Drury (Rance 83), Payne, Graham (Whitely 80), Cheek (McDonald 90), Kedwell. Subs not used: Weston, Miles. LOFC: Brill, Ling, Happe, Elokobi (Turley 66), Widdowson, Maguire-Drew (Harrold 66), Lee (Clay 66), Lawless, Brophy, Koroma, Bonne. Subs not used: Sargeant, Alabi.